Bass club and fishing tournament directors – its time to step up and match your awards to the achievement. Bass Trophies Online was created to be the ultimate one-stop shopping experience for all your bass and freshwater fishing trophy needs. Our clients understand that long after the prize money is spent, Bass Trophies Online awards stay proudly displayed in anglers’ homes and offices as a constant reminder of their special accomplishment and your event. Our clients tell us that these custom and very classy awards help keep their anglers coming back for the win, stimulating better angler participation. 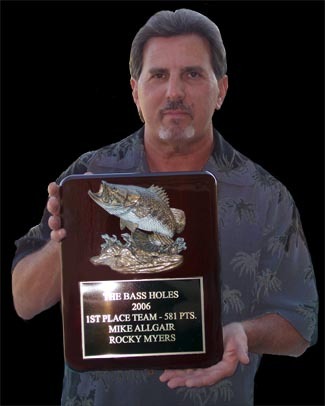 Top notch tournament trophies, awards and bass art are just a call away. 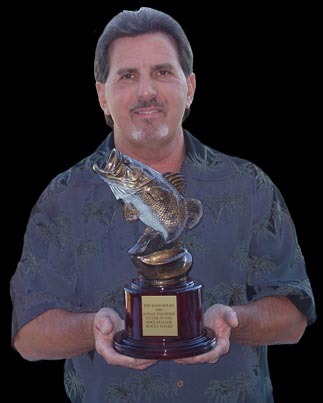 This phone number – 954-562-7900 – is a direct line to Ross Myers, the owner and head artist behind this very unique custom line of fishing art, trophies and awards. Ross Myers’ life has revolved around the fishing world for over forty years, he is an accomplished bass and inshore tournament angler, lure designer, custom lure airbrush artist, sculptor and outdoorsman. Using his many artistic skills, Ross hand sculpts all of these designs and molds. He and his very talented staff manufacture all of the awards and trophies here in the U.S.A. All of our painted art and tiles are originals as well, and our graphic artists work diligently to create unique awards, as well as banners, signage, club decals, boat and vehicle wraps and soon, T-shirts, for our clients. Bass Trophies Online is a division of RWM Designs (saltwater division), which manufactures some of the finest, most innovative tournament fishing awards and trophies on the market. These art pieces and trophies range from decorative to functional, and have been showcased by many prestigious events. Some of our clients include: The Extreme Bass Series, King of the Glades Bass Series, Bass Pro Shops, The Key West Fishing Tournament, Pompano Beach Rodeo, the Miami Billfish Tournament, The Saltwater Slam and Shootout, The CCA, The Florida Outdoor Writers Association, South Dade Anglers, The Florida Wildlife Commission, The Redbone Series, The Islamorada Sailfish Tournament, The Bertram & Hatteras Shootout, just to name a few. Please enjoy the art and trophies shown here and feel confident that all items are proudly designed and handmade in the U.S.A. You can expect quality and personal customer service unmatched, at very reasonable pricing. Along with our trophies, home decor items and gifts, we also offer product development, prototype design, web and logo design, and also specialty custom and corporate items.